$15.5 million in direct spending on the exhibition’s total presentation, including building materials, construction, operation, disassembly and promotional and educational materials. An estimated $26.3 million in incremental spending by the 1.4 million visitors to the show. The work, commissioned by the Public Art Fund and presented in collaboration with the city, was the city’s most ambitious public art project since “The Gates,” the February 2005 installation by Christo and Jeanne-Claude, who festooned Central Park with saffron-colored fabric. “Waterfalls” visitors saw the exhibition from an average of 2.6 sites around New York Harbor’s waterfront. Hundreds of thousands of others viewed the Waterfalls during their daily commutes or as part of other routine activities. Of these 1.4 million “Waterfalls” viewers, about 79,200 were visitors to the City who, were it not for the Waterfalls, would not have visited or extended their visit to New York. About 590,000 visitors came to the city from elsewhere in the metropolitan area, from communities across the U.S. and from at least 55 other countries. According to the report, 15 percent of “Waterfalls” viewers who stayed in a hotel chose a hotel in Lower Manhattan. Less than 7 percent of New York City’s hotel rooms are in Lower Manhattan, suggesting that those visitors disproportionately chose Lower Manhattan hotels over others in the city. 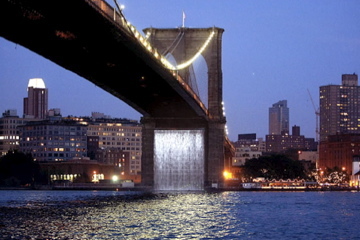 Over all, according to the survey, 23 percent of Waterfalls viewers – more than 320,000 people – made their first trip to the Lower Manhattan or Brooklyn waterfront to see the Waterfalls. According to the survey, 44,500 New Yorkers made their first trip to the Lower Manhattan or Brooklyn waterfront to see the Waterfalls.